Bambrella Side Wind Hurricane 3.4m Square Spuncrylic Parasol: This large side pole parasol has an impressive 360 degree turning base and a 45 degree tilt to enable to you provide shade no matter which direction the sun is coming in from. This premium parasol is ideal for both domestic and commercial use and is made from only the finest quality materials such as aluminium to prevent rusting and marine grade nylon to stop any fraying or noticeable wear. 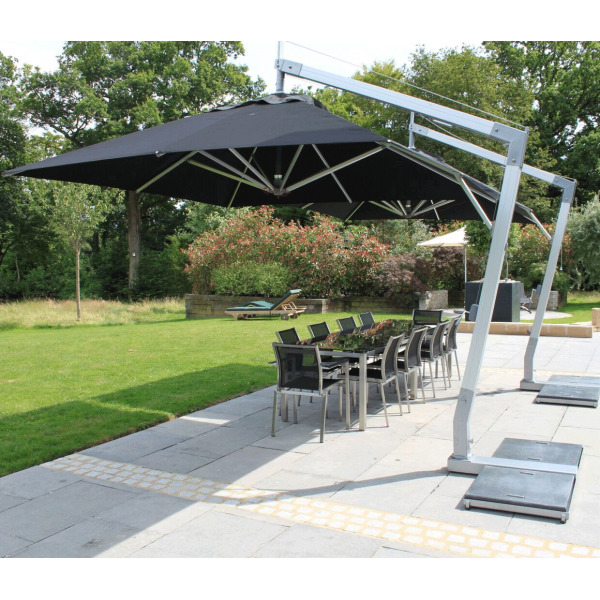 The Parasol features a double rope and pulley system for easy opening and closing. This base on this parasol has adjustable feet to find the perfect level even on uneven surfaces. Included with this parasol is 2 x 70kg granite base slabs to ensure security and stability.